With your own Google account, you can access and use many different Google services, such as Google My Business, Gmail, YouTube, and more. 1. Click here to begin creating your Google account. Note: In the Choose your username field, you can either create a new email address or use an existing email address. 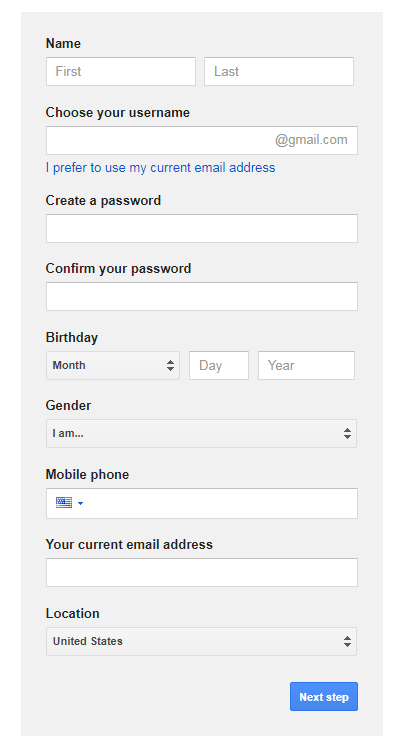 If you use an existing email, then select I prefer to use my current email address and complete the form. 3. Once you have completed the form, click Next Step. Then scroll down and click Accept. 4. Google will send a verification message to your email. Please check your email and follow the link to finish creating your Google Account. Google Email Verification will be in the subject of the email. Now you're ready to request an invitation from Web.com to manage your Google My Business Listing. Click here to get started. Google My Business Listings—FAQs and Troubleshooting Web.com—How Can I Co-Manage My Listing? Web.com—How Do I Manage My New Google My Business Page?